Food for fun is taking it easy this week. After the excitement of last Thursday’s crazy Halloween bash, it’s time to take it down a notch. Instead of offering original fare, I’m paying it forward by sharing experiences with recipes found elsewhere. If you’re looking for recipes and photos that make you drool, a trip to Cottage Grove House should do the trick. 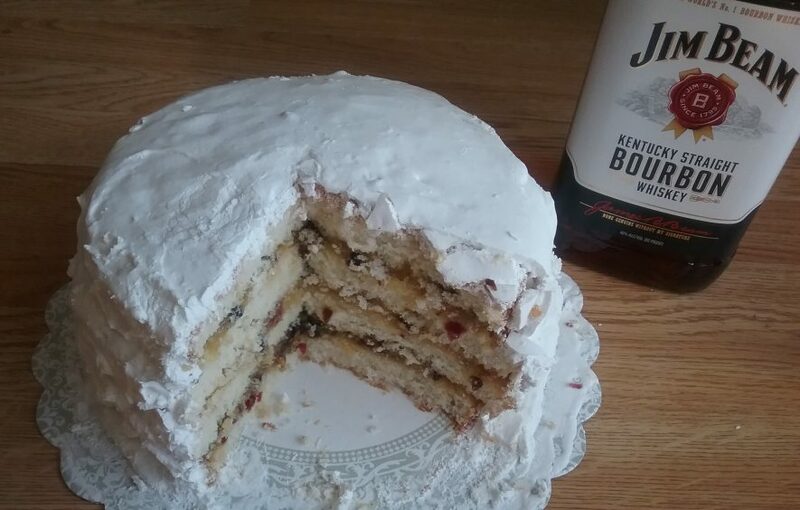 Last August, a post for Cherry Yogurt Cake stopped me in my tracks. 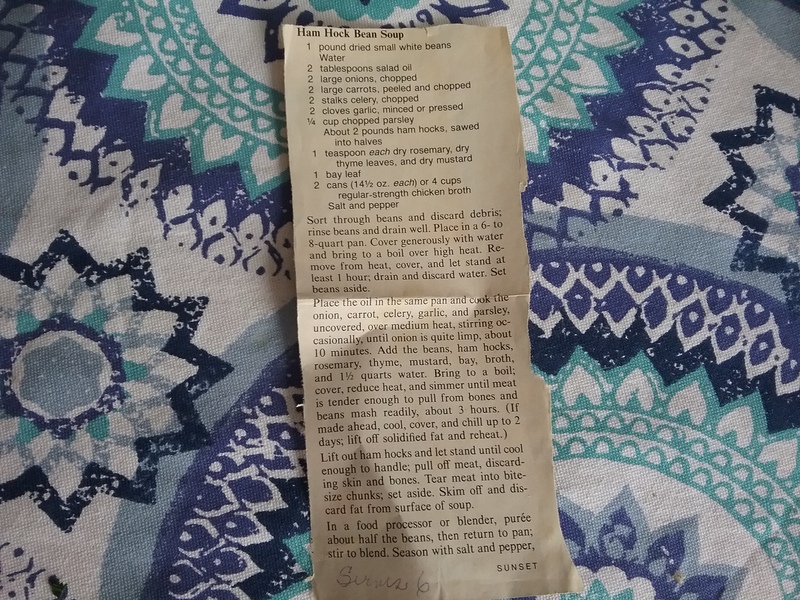 I was struck by the recipe’s simplicity. What would one need to make this pretty little cake? Only butter, sugar, eggs, flour, baking powder, yogurt, and cherries. Last week brought time to make the cake and it was everything I hoped it would be: spectacular in its simplicity. Of course there were changes, though none made deliberately. About halfway through slicing through the bag of cherries I’d frozen last summer, I realized there were no pits (can you say “autopilot”?) and upon closer inspection saw that the cherries were red grapes. Huh. Well, why not, thought I and went ahead with my newly named Grape Yogurt Cake. I also neglected to use vanilla yogurt and didn’t add vanilla to the plain yogurt I did use. But in the end it was a stunner. As much as I love fancy-pants desserts, there’s something so lovely about a simple white cake. 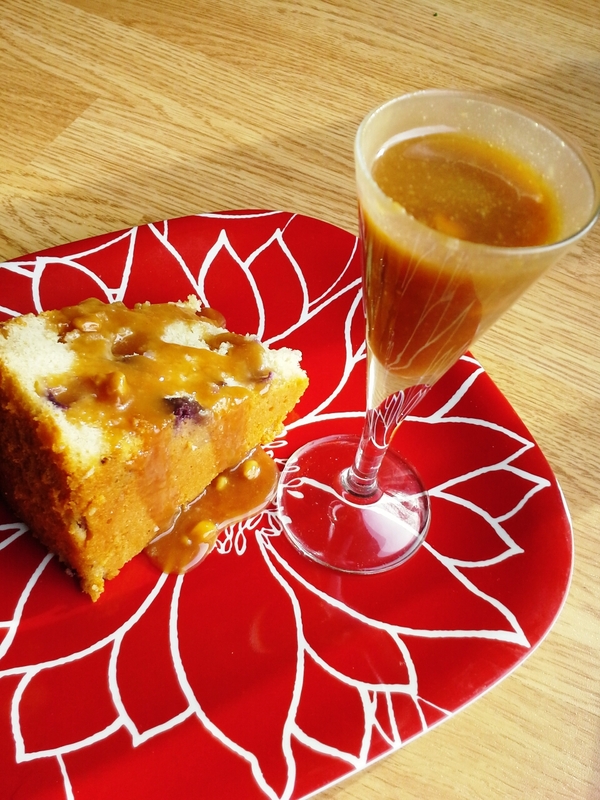 The grapes had me thinking peanut butter, so I added a spoonful of two of chunky-style to warm caramel sauce and served it alongside, christening it PB&J Cake. I’m certain the cake would be smashing made with only cherries as well. Three cheers for Cottage Grove House! Glad for yet another excuse to bake, I set out to make the muffins. 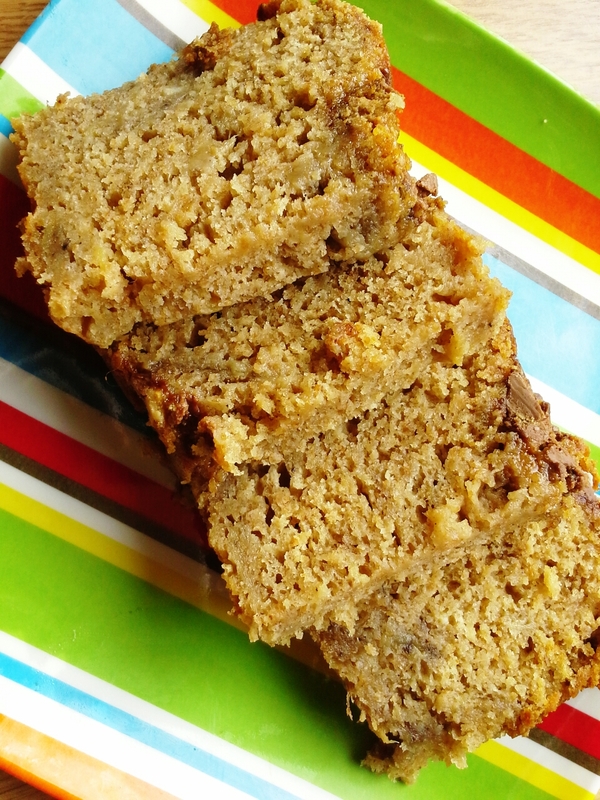 A note on the recipe mentioned the option of turning it into banana bread–even better. 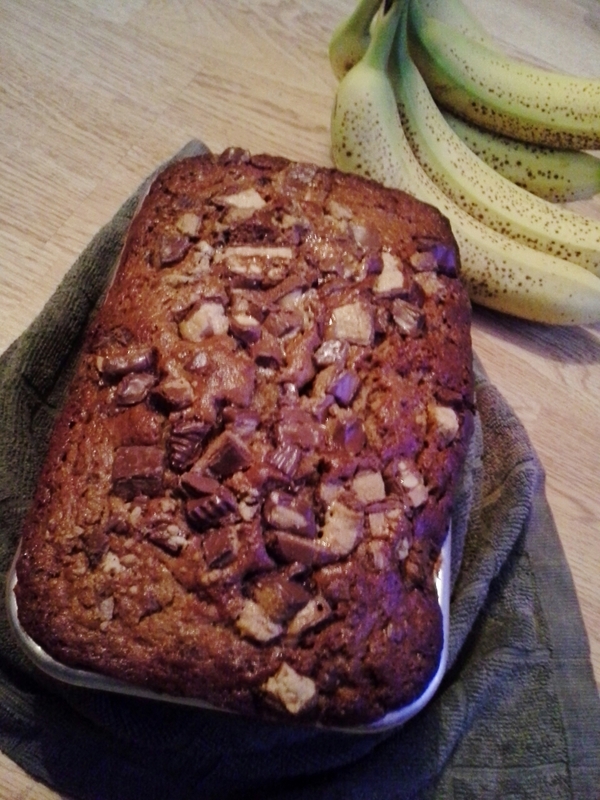 The loaf still got a generous topping of chopped Snicker’s and peanut butter cups per amb’s photo. Glorious and amazing, this quickbread makes breakfast and snack time very bright. Thanks, amb! 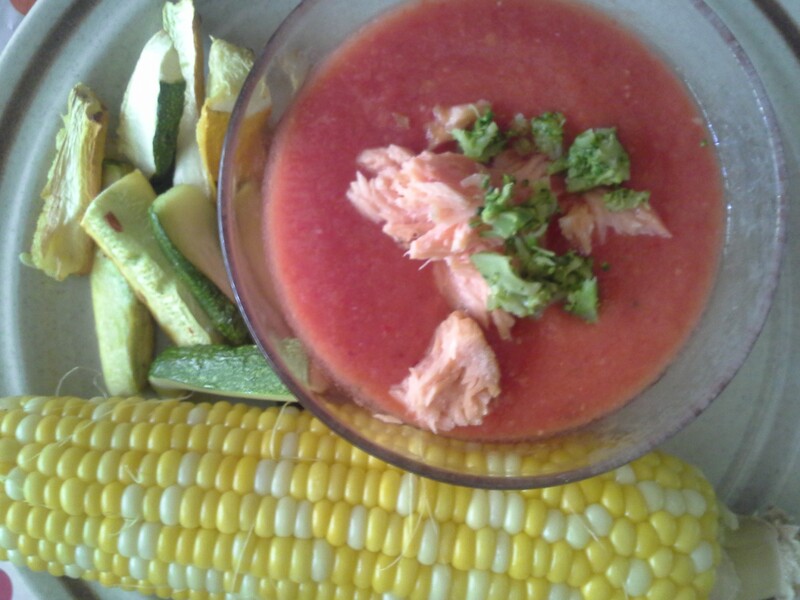 Finally, I’ll share a healthier recipe, with which I was also enamored. True to form, it took me a while to get around to making a Weary Chef soup that caught my eye back in February. 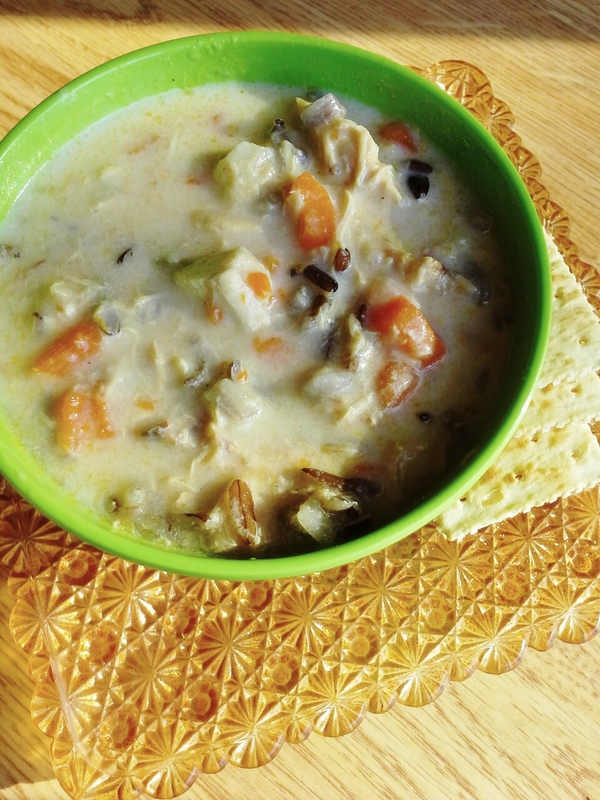 My daughters love Panera’s chicken wild rice soup, and this seemed a healthier but equally lovely version. I went totally DIY with this one, starting with a large kettle of water and a whole chicken. After making stock, I proceeded with WC’s recipe and ended up with a pot of mmmm-good soup. After two large bowls, I was full and warm and happy. My girls enjoyed theirs as well, and I liked that it was chock-full of veggies, whole grain, and lean protein. Weary Chef is about much more than her Happy Hour, people! Wishing you a most excellent and delicious week. It was just my girls and me for supper tonight as my husband worked late. A bag of lentils in my pantry had me thinking lentil soup and a gift of a tomato flat meant that BLTs would accompany. When mealtime rolled around, my youngest asked if we could eat outside. It’s been a beautiful and unseasonably warm 80°F day and al fresco dining seemed a lovely idea. 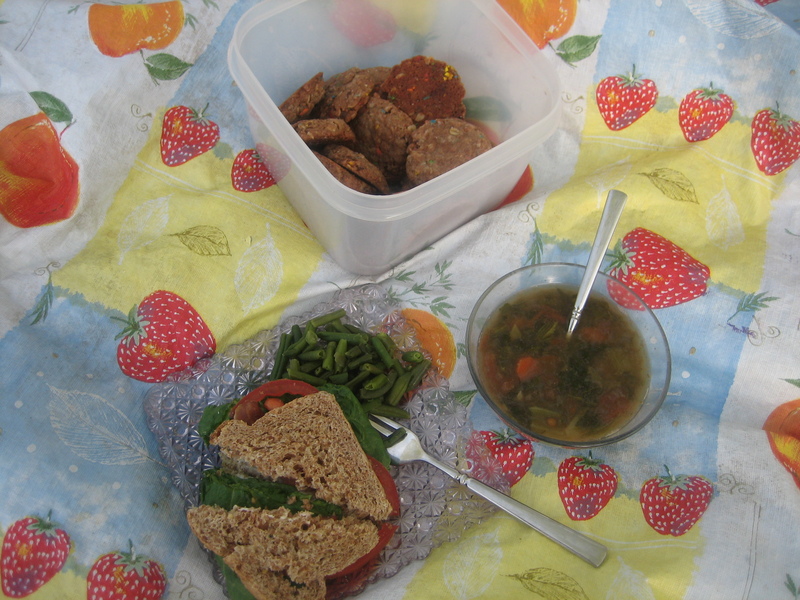 The components were simple and the picnic was served up on our front lawn. The girls enjoyed the sandwiches and at least tried the soup. Reheated (frozen) green beans added the vegetable group. Leftover cookies (which just keep getting better) are always a welcome finish to an outdoor meal. Nothing fancy. No waterfall or other picturesque nature in the background. But it was an easy way to freshen up mealtime. And not having to sweep up under the table? Bonus. In large stockpot, heat small amount of oil over medium-high heat. Add celery and carrots; sauté 3 to 5 minutes or until slightly softened. Add lentils, garlic, onion powder, and bay leaf; sauté 2 to 3 minutes or until garlic is fragrant. Add chicken stock and water; cover. Bring to a boil; reduce heat. Simmer 20 to 30 minutes or until lentils are tender, adding additional stock or water as needed. Stir in spinach and parsley; cook until heated through. Season with vinegar, salt, and pepper. Cook 5 to 10 minutes to blend flavors. Adjust seasoning as desired. Remove bay leaf before serving. Makes 8 servings. My youngest and I ran errands today and I looked forward to lunch out with her. She lobbied for Mc D’s or Subway, but I held strong to trying a local spot I’d often driven past, but never had time to stop at. Razs Coffee & Ice Cream Cafe also advertises soups, sandwiches, and bakery, so I was sure lunch could be found. The shop was small and mostly empty, though arriving at 1:30 meant we had probably missed any lunch crowd. The sandwiches looked decent enough, but I couldn’t get excited about chicken, tuna, or egg salad fillings. The soup for Monday was Chicken Noodle–bingo. My daughter and I each ordered a bowl. It came with a roll and crackers–standard cafe fare. I also ordered an Americano as the shop’s coffee scent was beautiful and strong. Our soup was very very good. I doubt it had been made using fresh local ingredients; it most likely came premade in a plastic pouch. But it was for sure a step up from canned. The noodles were so soft they fell apart on the spoon (not the al dente you want in a proper pasta dish, but just the ticket in chicken noodle soup), the chicken chunks were big and meaty, and the broth was salty and rich. It was a fun soup to slurp with my daughter and we emptied our bowls. The Americano was also excellent–it included the elusive crema you don’t always find floating atop espresso drinks. Not everything was amazing, though: The rolls were on the dry side and the packaged crackers were borderline stale. In the end, dessert trumped all: Ice cream was a must–this was Razs Coffee & Ice Cream, after all. (Though I was tempted to take home one of the chocolate chip cookie bars as they looked fantastic.) My Caramel Collision Malt was truly yummy and my daughter’s ice-cream streaked mouth was proof that she enjoyed her mint-chocolate chip kiddy cone. As we ordered our ice cream, I noticed Daughter getting dangerously close to a display of breakable serving dishes. 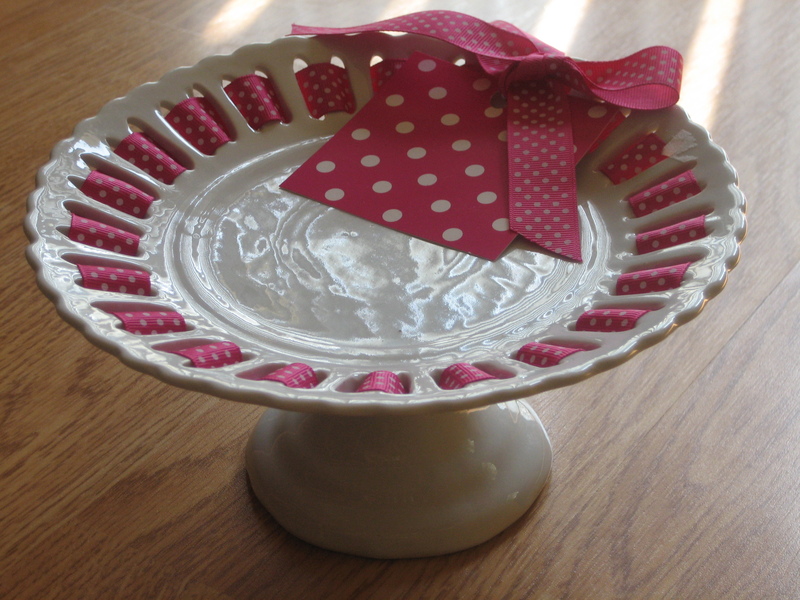 I approached, ready with my “look with your eyes, not with your hands” speech, but instead fell in love with a small ribboned cake stand. It was priced at an incredibly affordable $10 and was just what I need for my Easter centerpiece. I added it to our $15 tab (couldn’t have had the meal for less even at McD’s) and left with a cake plate in one hand and my daughter’s little hand in the other. found this at an ice-cream shop--so pretty! The meal at Razs wasn’t 5-star, but I felt better about handing my dollars over to a man behind the counter who actually owned his one-of-a-kind shop rather than pay for a so-so meal at one of the many chain giants that seem to rule today’s dining scene. It was delightful to find good food and Martha Stewart–worthy servingware in a suburban strip mall. I’ll be back. I still need to try the chocolate chip cookie bars. 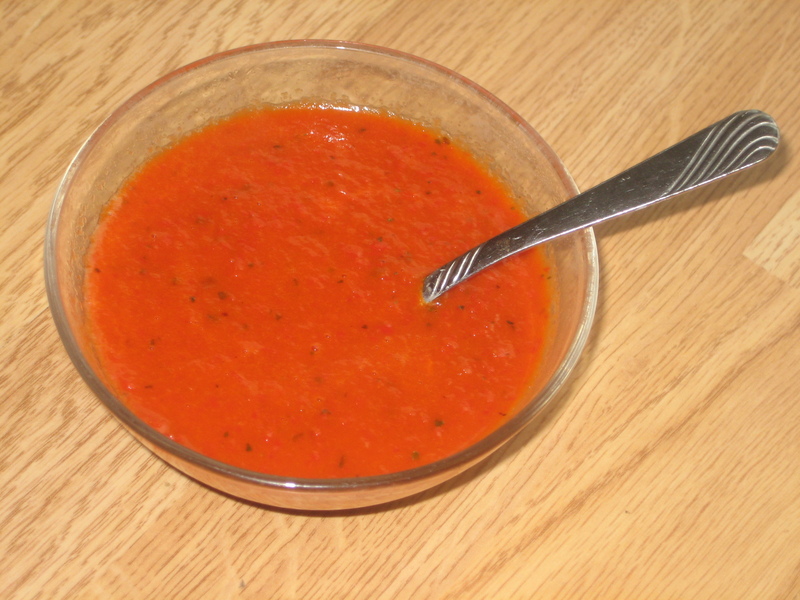 A recent sale on red bell peppers got me thinking about pureed bell pepper soup. Today was the day for this soup. Not wanting to take time to find a recipe, I made it up as I went along. This cooking philosophy doesn’t always serve me well, but today I struck gold (or ruby?). The results were just what I’d hoped for. First, I chopped and seeded 4 large red bell peppers. Next, the peppers sautéed in just a bit of olive oil. When the bell peppers were just starting to brown, I added a splash of white wine (1/4 cup?) and a spoonful (1 tablespoon?) of low-sodium chicken bouillon. I stirred to dissolve the bouillon, then poured in about 1 cup (maybe a bit less) water. Next, I added about 1/2 to 1 teaspoon dried basil, covered the saucepan, and simmered the soup until the bell peppers were tender (15ish minutes). A quick whir with the immersion blender pureed it smooth (you could also transfer the soup to a traditional blender for the puree). The pan was removed from the heat so I could add 1 to 2 tablespoons 1% milk and about the same amount plain low-fat yogurt. Stirring in the dairy off the heat was important as both are low-fat and sure to curdle the high-acid soup if brought to a boil. It was all pinch-and-dash, so I was glad to see the soup turn out well. The color was bold and the flecks of dried basil added a touch of rustic. Pressing the finished soup through a fine-mesh strainer would have rendered it smooth as silk, but I preferred the hint of texture from the bell pepper skins. 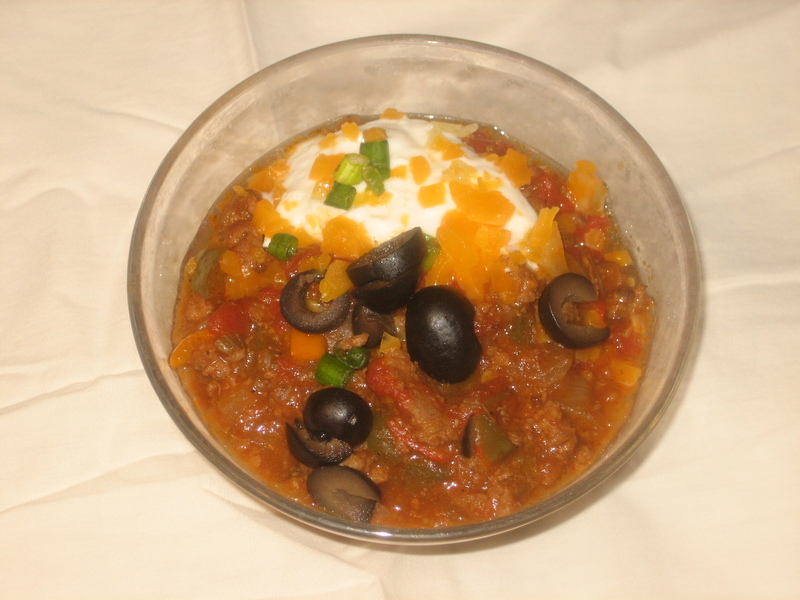 I loved the deep and savory flavors–lots of bell pepper with a heavy hint of basil. And when I did the math, I figured I’d eaten half of the recipe (which made about 3 cups total). That means I downed two (!) large bell peppers. Wow. That’s some serious vitamins A and C as well as fiber and all the healthy “plant chemicals” we hear so much about. A very nutritious bowl of red, for sure. My husband took our oldest daughter to Chili’s for lunch yesterday. She bowled me over by raving about her dad’s order of chili. Since when did she like something as complex as chili? There are at least six different foods “touching” in any bowl of red, which seems an automatic turnoff for her picky 9-year-old taste buds. Chili also has potential to be nutritious, which should also make it unappealing to her. She usually sticks with kid faves such as mac-and-cheese or pizza when dining out. Which is why her announcement that she LOVED Chili’s chili floored me. Not one to let a healthy food opportunity pass by, I hopped online and searched “Chili’s chili recipe.” Got a page of hits, one of which led me to a recipe I thought I had a shot with considering my pantry contents. Ironically, this recipe contained no vegetables save one onion and a can of tomato sauce for eight servings. I changed it up a bit (see pepper pots for more on my ability to follow recipes), cutting the beef amount in half, adding bell peppers, and replacing the tomato sauce and soup (!) with canned tomatoes. A bottle of Corona was sitting on the counter, so couldn’t help but add a slug to the pot; a spoonful of cocoa power also made it in. The recipe called for masa flour to be stirred into the chili at the end of the hour-long simmer, but unable to follow a recipe, I threw in a few tablespoons of cornmeal (no masa flour in the house) just after the beef and veggies were browned. Voilà (or olé? ), a pot of chili was born. Topped with shredded cheese, olives, sour cream, and sliced green onions, it was a mild and lovely winter warmer. The best part–my family loved it! My husband is an easy sell as he’s as supportive as they come. But getting it past my girls was huge. I was ecstatic that they loved a dish that was packed with vegetables and out of the realm of foods they normally eat. I include the recipe here, but know that this is an approximation. With all of the slugs and handfuls, I’m only guessing on amounts. In large saucepan, cook beef and onion, stirring occasionally, until browned. Add bell peppers and garlic; sauté until vegetables are tender. Stir in remaining ingredients except salt and black pepper; cover. Simmer 40 minutes or until slightly thickened and flavors are blended. Season with salt and black pepper. Serve with favorite toppings. Bell peppers are on sale at a neighborhood grocery this week, which is a good thing. I love the vibrant colors of yellow, red, and orange bell peppers. I already had a stash of green bell peppers in the refrigerator thanks to a gift from a neighbor. The peppers would serve as inspiration for tonight’s supper. I immediately thought “pepper pot soup,” though not sure why as I’d no idea what it was. A bit of online searching uncovered two types–a Jamaican hot pot of sorts with yams, coconut milk, and hot chile peppers. The Philadelphia or Yankee version was more what I had in mind: beef, carrots, celery, okra (had some on hand from a recent project), tomatoes, and the namesake bell peppers. I’d love to share a recipe here for what I made, but can’t. It’s not that I don’t want to follow recipes; my livelihood is developing, writing, and editing recipes, after all. It’s just that I never seem to have all of the ingredients I need. Or I mess up somewhere along the way. But I use what I have and move through “mistakes,” because I know that recipes are only springboards (am talking cooking here–this laissez fare attitude doesn’t usually hold for baking). When I made tonight’s pepper pot soup, I loaded up on the bell peppers, replaced the tripe with short ribs, added thyme, beer, and a splash of white wine vinegar for more flavor depth, skipped the water and bouillon in favor of the stock I’d made with beef soup bones (one of the easiest ways to make something spectacular), used twice as much okra as the recipe called for as I wanted to finish the bag, and probably some other “tweaks” I’m not recalling. Could I make the exact same soup again? Nope. Was it good? Absolutely. My daughters picked out most of the vegetables, but they tried something new and I consider that a success. Beef stock is as easy as throwing a few ingredients into a pot and letting it simmer. Freeze the stock in ice-cube trays, then pop the cubes into a resealable freezer bag for quick hit of broth. Or freeze in 1- or 2-cup portions. Heat large stockpot over medium-high heat. Add soup bones; cook, turning, until browned on all sides. Add remaining ingredients. Cover pot; bring to a boil. Reduce heat; simmer uncovered 4 to 6 hours. Strain and discard solids. Skim fat from surface of stock or refrigerate and remove top layer of chilled fat. Season stock with salt, if desired. Refrigerate or freeze to store.